Vacation rental apartment. Sleeps 4, 2 bedrooms, 2 bathrooms. Dogs allowed. Kitchen counter bar where you can keep the chef company while cooking. Living room in background. 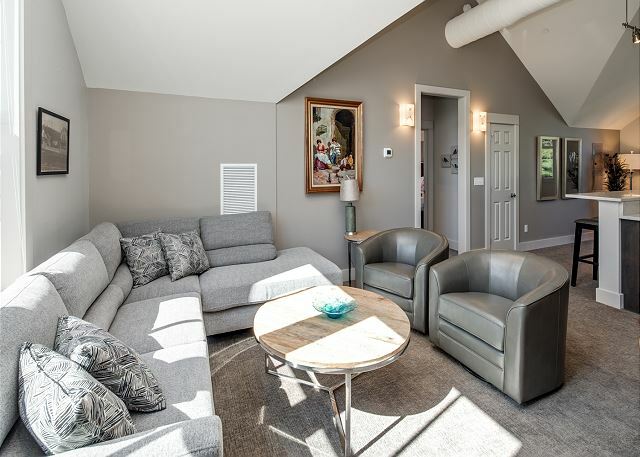 Tillinghast Residence apartment "E" is spacious and beautifully decorated with high vaulted ceilings throughout. Two equal master king bedrooms each with luxury bathroom. Living/dining combination area with designer sectional and barrel chairs for comfortable seating while conversing or watching Ultra HD television. View of combined living/dining concept in this spacious luxury apartment. View of the large kitchen and dining counter. High- end stainless appliances. 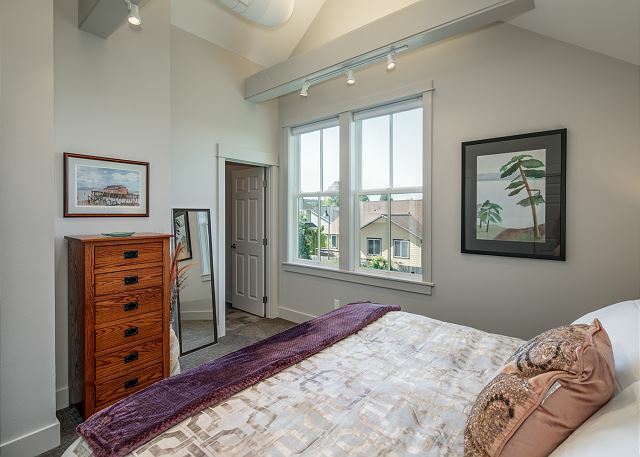 One of the master bedrooms with bathroom attached. Beds are the hotel version "Heavenly Beds" by Simmons with luxury linens. 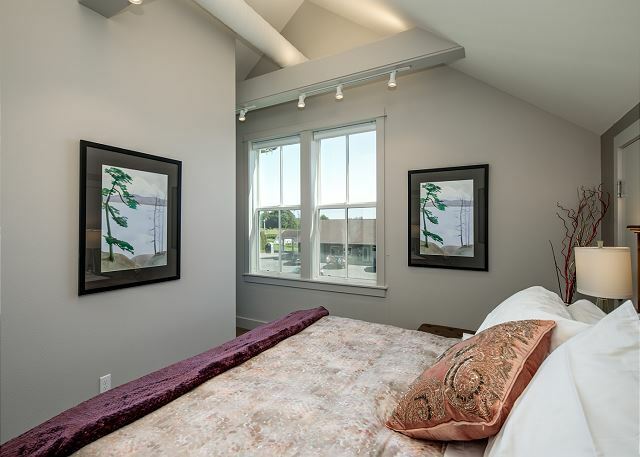 Note bedroom high vaulted ceilings with up/down lighting on beams. Art work is original watercolor done by a know artist. 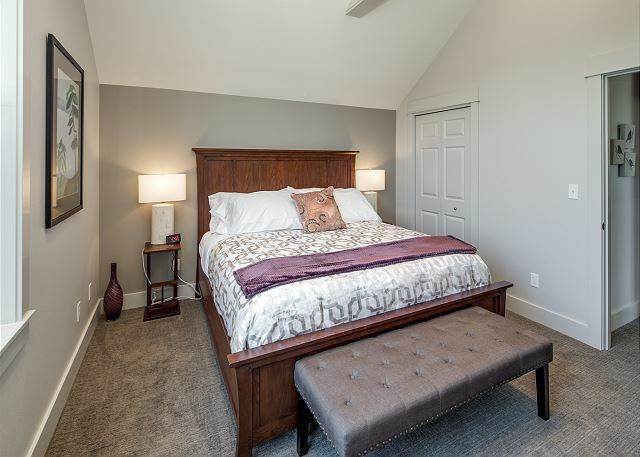 Another view of the southern master bedroom. Northern master bedroom with king size luxury bed and mattress. Linens to die for as well as high-end hotel grade towels. Another view of Northern master bedroom. The laundry is through the open door, plus more original artwork. Northern ensuite bathroom with walk-in tile shower and floors. Quartz countertops. 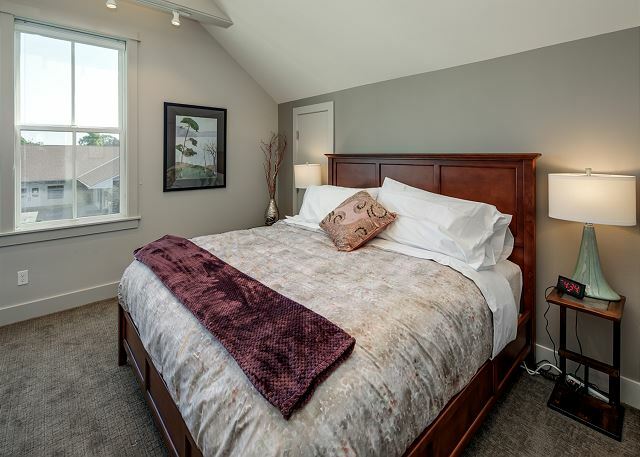 TULIP FESTIVAL SPECIAL PRICING STARTING MARCH 15 THRU APRIL 30, $195/NIGHT SUNDAY THRU THURSDAY, $225/NIGHT FRIDAY AND SATURDAY. 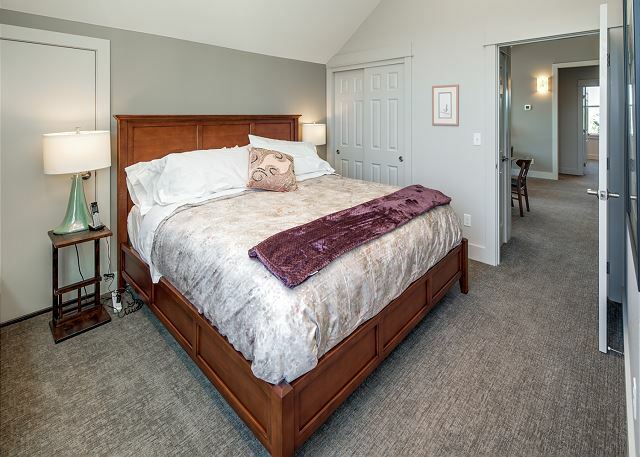 As part of the original 1800's Tillinghast property in La Conner, and located adjacent to the popular Seeds Bistro, this just-completed upstairs, two-master bedroom, two bath luxury apartment is being offered for vacation rental. Everything is brand new with the interior having been removed to the studs and remade as a high-end apartment with many upscale, special features. 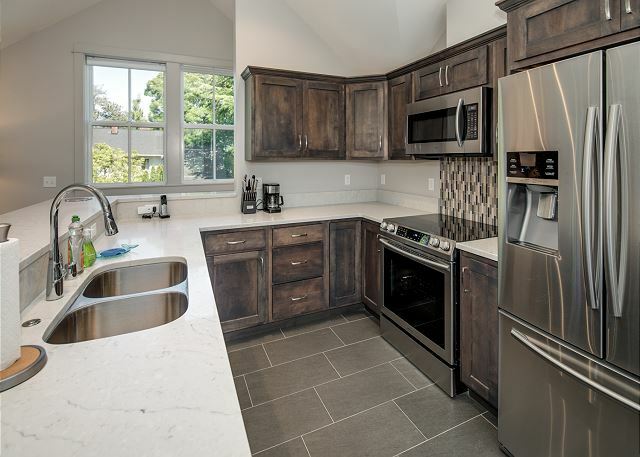 The kitchen features all Stainless Steel upscale appliances and quartz counter tops. 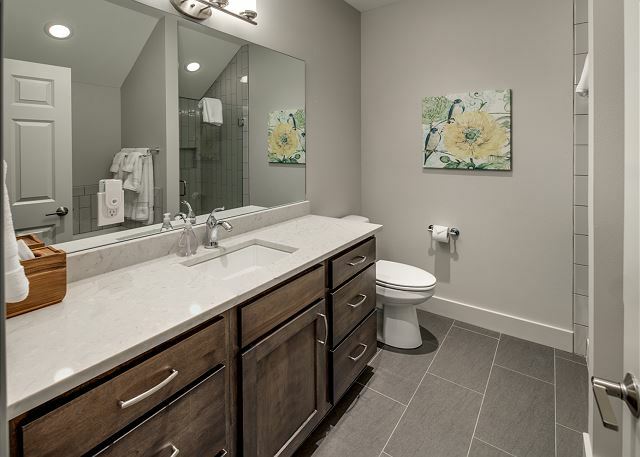 One master bathroom includes tile floor, quartz vanity top, and separate soaking tub and ceramic tiled shower. 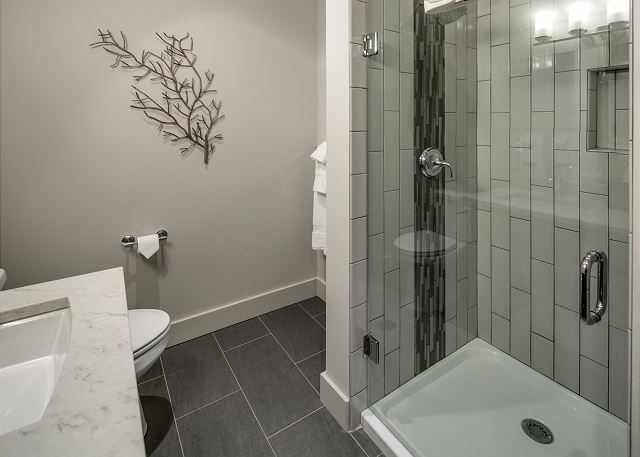 The second ensuite bathroom provides tile floor, quartz countertop vanity and a tiled stall shower. 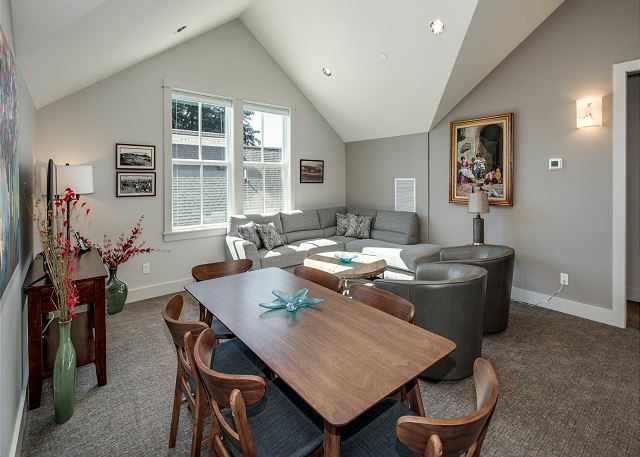 This apartment has high vaulted ceilings with up and down lighting throughout. The floors are covered with luxury carpet, and the interior colors add to an overall feeling of luxury and good taste. The two Master bedrooms feature a beautiful king bed with extraordinary Simmons Beautyrest "Heavenly" mattresses, as seen in the highest-end hotels, including fine linens and towels to match. To complete the luxury feel, this apartment is fully air conditioned and all walls and windows are insulated for interior quiet. All windows have shades and the bedrooms have blackout curtains for your pleasure and privacy. The Ultra HD smart 55" television will keep you entertained at night. But the real fun will include a walk to La Conner's iconic downtown. Three of my friends and I met at in La Conner where we talked, laughed and played games together over the weekend. We were very comfortable in our vacation getaway. The property description is completely accurate. It was clean and comfortable with all the amenities we needed. We had a nice meal at the bistro in the same building and enjoyed the shopping and sights in La Conner. The weather cleared for perfect viewing of the daffodil and tulip fields. We hope to meet in the same comfortable and convenient apartment in the future. We booked both Tillinghast units for our clients during a conference we hold here in La Conner. They loved it! The units are close to our office, clean, and beautiful. Thank you! We were very comfortable and were able to walk to restaurants. Seeds and COA were both very good! The beds were great and enjoyed all the different pillows to choose from! Only issue was one window at top of stairs was off its track so it let in some cold air which really wasn’t a big deal since it was far away from sitting area. We will definitely return and recommend it to our friends. We have a fabulous time! Very accommodating, comfy and clean. The location was perfect. The only issue we had was that the front door did not latch, so we had to push up on the door. We were used to this as we also live in an old home & have to do the same thing from time to time when the weather gets cold. Would rent this place again, no doubt about it! Who ever designed and decorated this this condo did a FANTASTIC job! For me it’s all about the beds, (comfort and linens) and they were great. Very clean, short walk to town (3 Blocks) and a spa and restaurant in the same building! Rental company very detailed oriented, welcoming and cooperative.